Brazilian Air Force contract given to Elbit's Hermes 900 drone to guard 2014 FIFA World Cup Games. Haifa-based Elbit Systems announced on Wednesday that it was awarded a contracted by the Brazilian Air Force (FAB) to supply its Hermes 900 Unmanned Aircraft System (UAS), a highly advanced drone. The drone carries a new and advanced intelligence gathering system, and will be used in security and safety missions in the 2014 FIFA World Cup Games. "We are very proud to supply our Hermes 900 to FAB, which is the eighth customer to be equipped with this leading platform," remarked Elbit UAS division general manager Elad Aharonson. The Hermes 900 is already used by the IAF, and sports a flight altitude of 30,000 feet in addition to a large payload capacity. 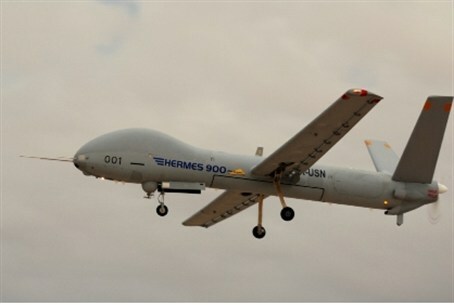 Elbit has supplied the Hermes 900 and its predecessor, the Hermes 450, to South American countries in the past. It also has won contracts with the US Navy to provide logistics support for various aircraft.